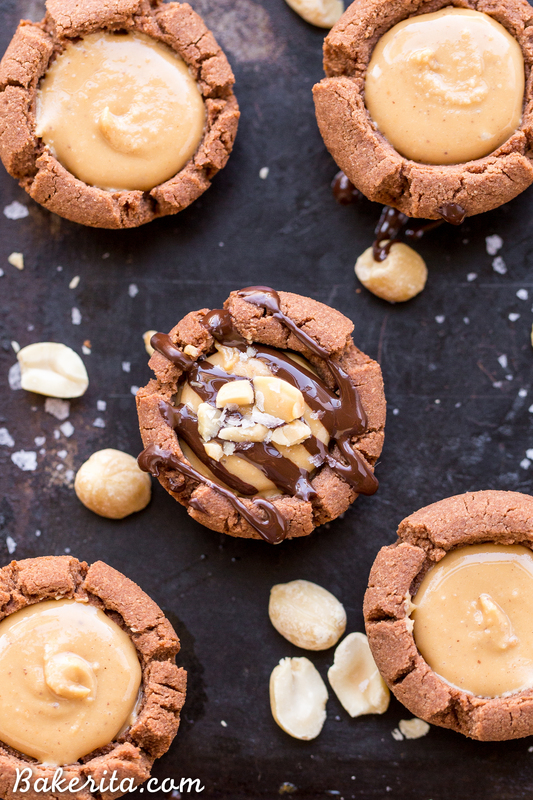 These Chocolate Peanut Butter Tartlets are sure to satisfy your sweet tooth! 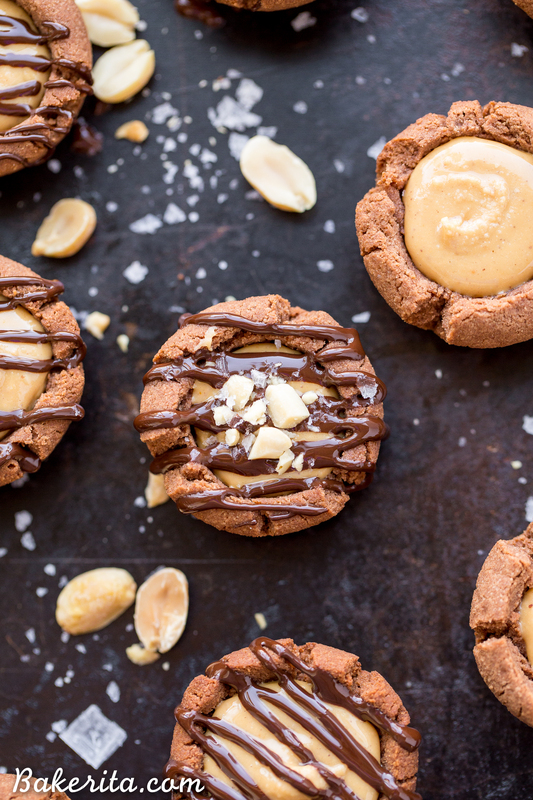 The chocolate shortbread crust is irresistibly crunchy, with a luscious peanut butter filling. You’d never guess these mini tarts are gluten free, grain free, refined sugar free, and vegan. This past weekend, I went up to San Francisco to visit my sister for the weekend. My sister, who has been gluten-free for about 8 years now, was one of the reasons I started to bake gluten-free, refined sugar-free and vegan treats. She’s also one of the reasons I started my site 7 years ago, and so I always feel obligated to bring her a bunch of the healthy treats that she, in some removed way, inspired to being with. I stocked up a few treats that I had made in the freezer, way in the back so they didn’t get eaten, in the week before I left. These Chocolate Peanut Butter Tartlets were among the treats I brought up to her. Of course, as soon as we got back to her house, she opened up her package and tried all the treats. Pretty immediately, these were announced the favorite. They were up against some tough competition, but I find it hard to resist chocolate and peanut butter in any form, and this form is a spectacularly good one. The chocolate shortbread tart crust is the base of the whole bite-sized treat, and it’s crunchy perfection. I baked the crusts for an extra minute or two past being fully baked, to make them extra crunchy, and they were perfect for my crunch-loving tastes. If you like a softer base, just bake for a few minutes less. The creamy peanut butter filling is the perfect complement to the crunchy chocolate crust – it’s super smooth and creamy, and reminds me of the filling of a Reese’s. Except of course THIS one has no gluten, refined sugars, or weird preservatives. Just some peanut butter, maple syrup, coconut flour (to help it set), and salt. Voila – simple, and so tasty. 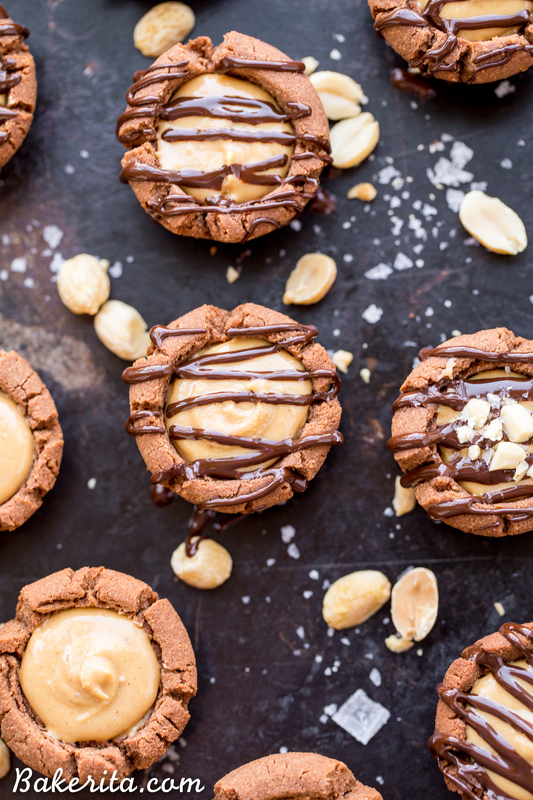 Once the crusts are filled with the peanut butter, the whole thing is drizzled with chocolate, and then garnished with some crunchy peanuts and flaky sea salt. The sea salt is optional, but you guys know I can’t make something chocolatey without putting some salt on it, so here we are :) I recommend you give it a try, if you’re on the fence. 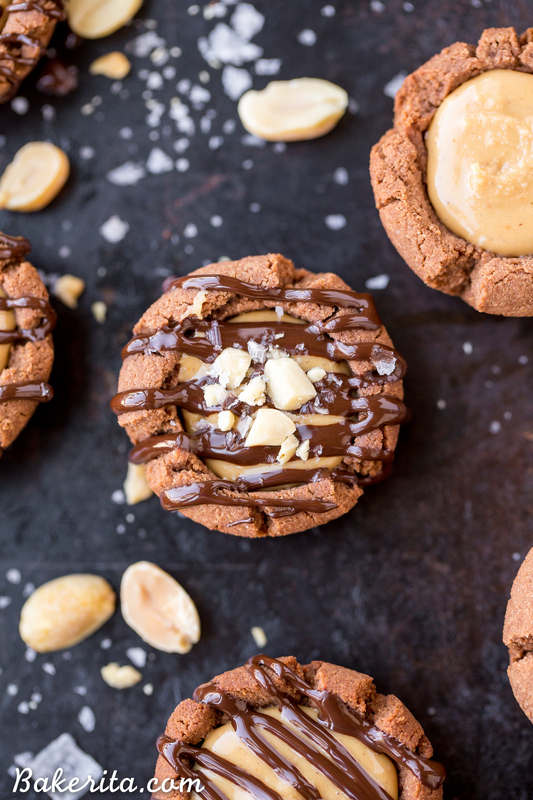 These taste like peanut butter cups, but with the added deliciousness of a chocolate shortbread crust – what more could you want than some crunchiness added to a peanut butter cup?! These were dangerous to keep around, because I couldn’t keep my hands off of them. 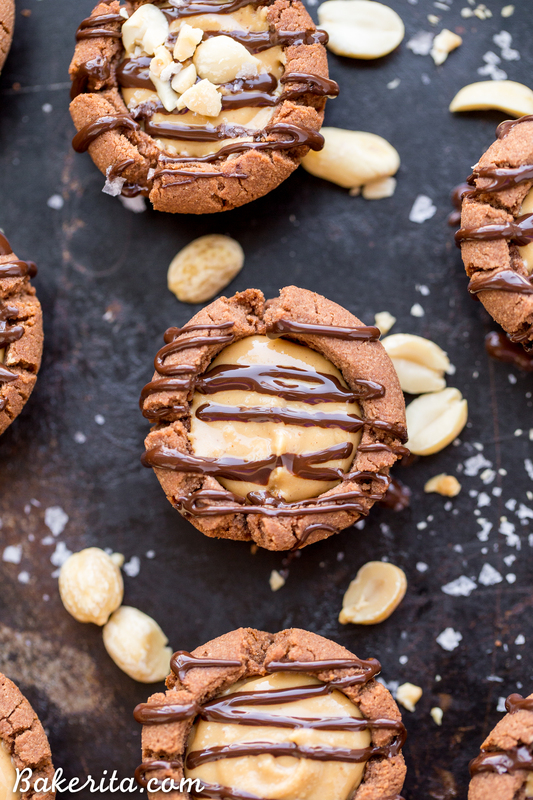 If you’re a peanut butter cup lover, these are a must try. Enjoy! Preheat the oven to 350ºF. Grease a 24-cavity mini muffin pan with coconut oil. Combine coconut flour, cocoa powder and salt in a bowl. Add the maple syrup and room temperature coconut oil and mix until a large dough ball forms, pressing out any clumps of coconut oil. If you're mixing with a bowl and spoon (not a stand mixer), you may want to use your hands at the end to bring to dough fully together and make sure there aren't any lumps of coconut oil remaining. Divide the dough between the 24 mini muffin cavities and press up the sides. Bake for 9 minutes for a softer crust, or up to 12 minutes for a firmer, crunchy crust. Let cool completely before using a toothpick or knife to pop the cups out of the muffin tin. While the crusts cool, stir together the peanut butter, maple syrup, coconut flour, and salt. Divide the peanut butter filling between the crusts, about a scant 1 tablespoon in each. Place in the refrigerator to set. Place the chopped dark chocolate and peanut butter in a heat-proof bowl and microwave for 30 seconds, stir, and then another 15 seconds. Whisk until completely smooth. Top each of the cups with the chocolate ganache - you can do this with a spoon, or put the chocolate in a piping bag and pipe it in for a cleaner look. Top each of the tartlets with chopped peanuts and flaky salt. Serve immediately or store in an airtight container in the refrigerator for up to 5 days. Hmmm, these look yummy! I’ll be making them with almond butter, instead of peanut butter, and a homemade chocolate drizzle, so they will be paleo friendly! I hope you love them Holly!! Will these freeze? I need to bake ahead! Yes they freeze very well! Just store in an airtight container. people need to all jump on the sea salt on desserts bandwagon!! I just made these and they are delicious! I did have a hard time getting the peanut butter middle the right consistency however, that could have been because I used my hand mixer. I just added a tablespoon of almond milk at a time while mixing until it became easier to use. It was still thick so I just piped it out using a large star tip. I ended up adding some more maple syrup to it after tasting because I like my sweets sweet. I will be making these again, thank you!